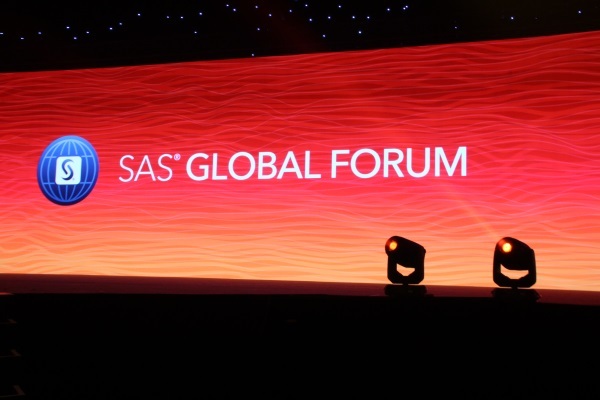 From the opening session on Sunday night through the Monday sessions, SAS Global Forum was full of new software updates and a further dive into SAS Viya – the company’s analytics cloud and machine learning platform. The central message of Global Forum revolves around the success of Viya and the company’s mission to bring analytics everywhere. A fitting message for a ‘Data Knows No Boundaries’ theme. Plus, Captain Sully regales the crowd. 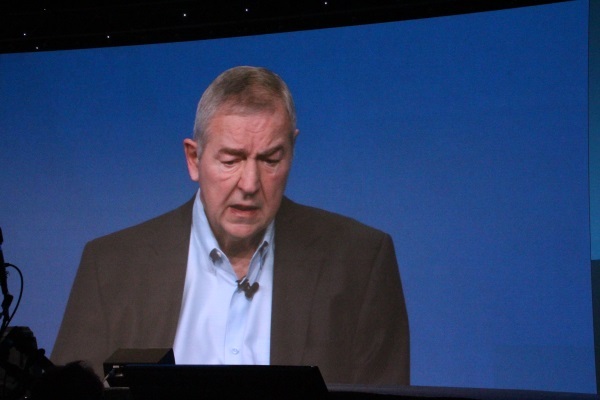 Randy Guard, SAS CMO, brought on Marcos Souza, vice president of Sprint’s cognitive and analytics center of excellence to preach the openness of SAS Viya and all the ways that it could be extended. 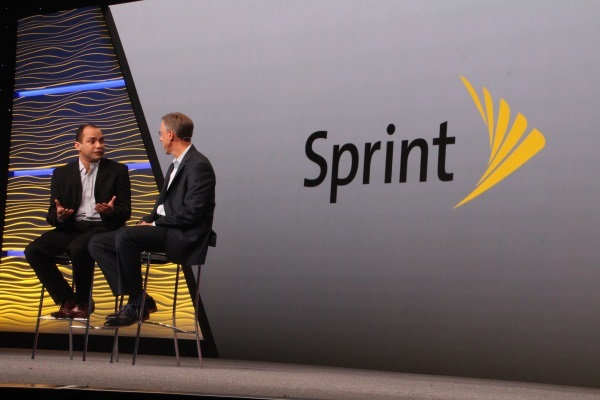 Souza spoke about the need for the means to analyze the exuberant amount of data acquired, and how Sprint is using SAS Viya to do that. “Today is our environment, we consume about 100 TB of data per day, and that’s only our company,” he said. 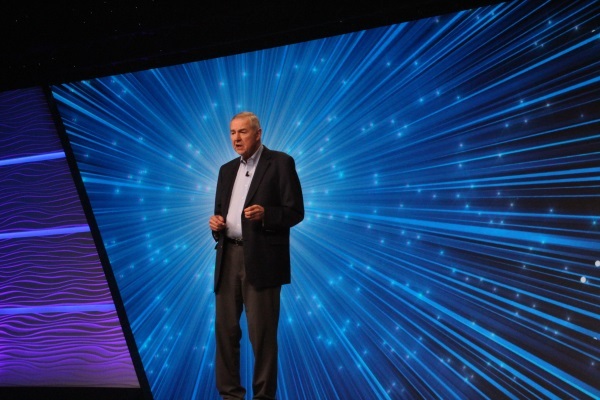 Dr. Goodnight retook the stage to showcase what SAS is doing with Amazon’s Alexa. Using an Amazon Echo device, the SAS CEO asked Alexa to pull up various data sets using SAS Viya integration. Alexa could find revenue or customer satisfaction charts, just to name a few, due to the custom algorithms SAS has written on Alexa’s programming. However, Alexa was being difficult. Apparently she does that sometimes. SAS has always been quite vocal about its education practices and efforts, and that didn’t change this year. Emily Baranello, SAS vice president of education, took the stage to talk about the success of SAS masters programs in over 63 universities. She highlighted the University of Alabama who has four SAS classes, including a data mining course, and two masters programs. On top of the 63 masters programs worldwide, SAS also has 144 joint certificate programs with schools across the world. 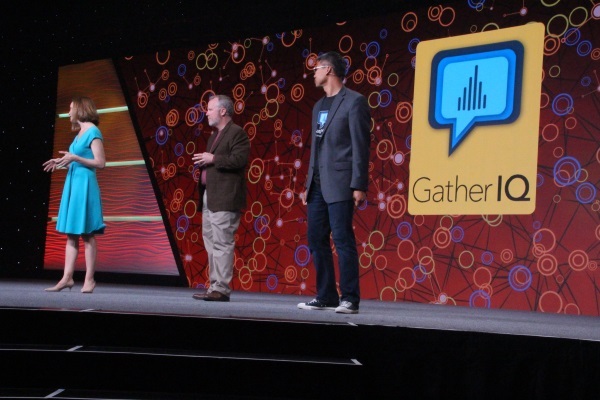 To close out the Sunday evening session, the show kept close to the education thread with the announcement of GatherIQ, a new app that will help humanitarian and nonprofit organizations by putting analytics in the hands of the public. 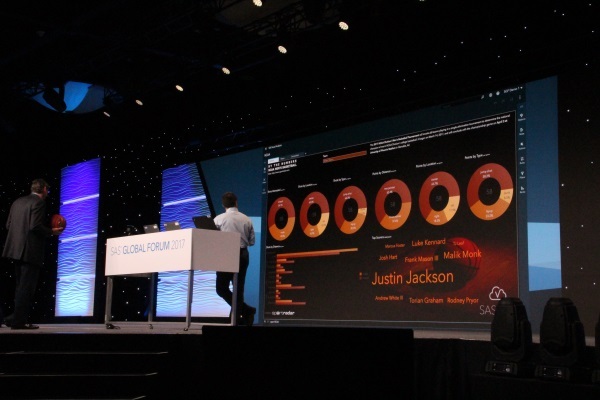 Using GatherIQ, users can help these organizations solve problems through access to SAS Visual Analytics interactive reports. Specifically, GatherIQ is designed to help the International Organization for Migration (IOM) with it’s United Nations Missing Migrants project. “The more people we have analyzing the data and contributing to solutions, the more likely we are to save lives,” said IOM spokesperson Leonard Doyle (center). 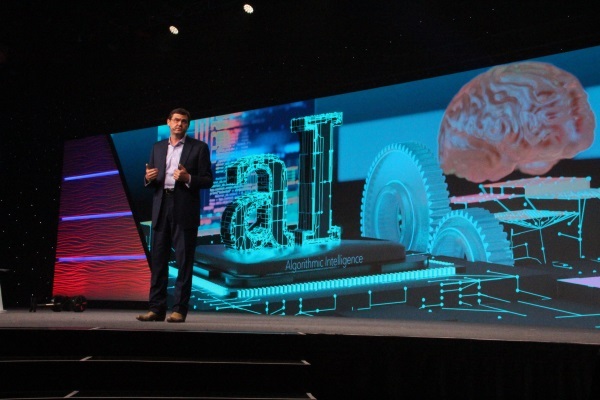 SAS CTO Oliver Schabenberger brought back the segway Monday morning to open the show by introducing some of the more exciting uses for SAS Viya. This includes a new Data Step Debugging tool in Enterprise Guide, Accessible Analytics that allow the visually impaired to work with SAS analytics, and using SAS Visual Analytics to better understand data. To showcase this, college basketball was used as an example. Using those statistics, SAS predicted the University of North Carolina Tar Heels to win the National Championship. Turns out they were right. 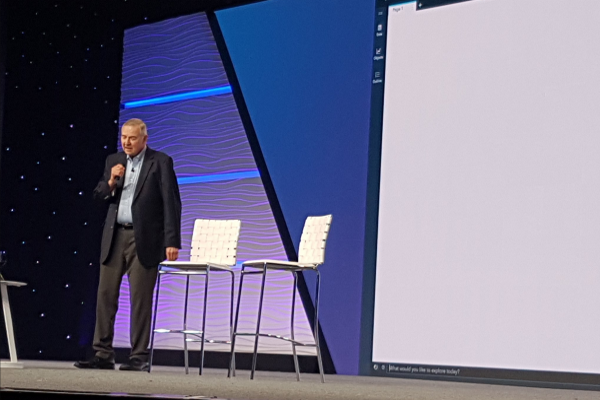 Schabenberger brought Dr. Goodnight onto the stage to talk about the extension of SAS Visual Analytics through SAS Viya. Dr. Goodnight talked about how memory is getting cheaper and that while per terabyte it is still relatively expensive, those costs are going down. And if you didn’t already think Viya is the future of SAS, Dr. Goodnight put those thoughts to rest. “Viya is simply an extension of SAS 9. By September, all the 9 platforms will be able to communicate directly with the analytic server,” he said. 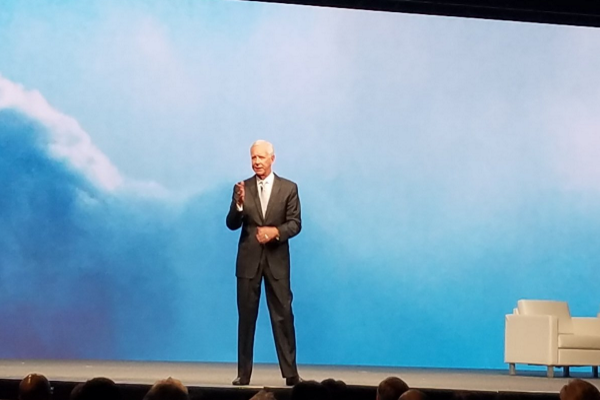 Captain Sully Sullenberger capped off the morning with a speech about the necessities of sticking to civic virtues in a world that seems to be losing sight in what is right, and putting emphasis on the work SAS Global Forum attendees are doing. “The purpose of science is to provide mankind with a more compatible and accurate understanding of society. We must be critical thinkers,” he said. Plus, Captain Sully provided a rousing recap of his infamous landing in the Hudson River.